Flip Out Mama: Room Rehab Blog Event: Plow & Hearth Peg Shelves! We are really excited to bring you a review from one of our favorite companies today, Plow & Hearth! We have loved Plow & Hearth and their sister companies for many years, even before I started blogging. They have such a wide selection of toys, gifts and home decor items, and they are really reasonably priced as well. This time around, we were lucky enough to get to review one of their awesome Peg Shelves for the boys' room as part of our Room Rehab Blog Event! Since we recently moved Baby Bean out of our bedroom and into Tater's room (lucky Tater LOL), there has been a huge influx of ,well, mess in there! I was really excited when we received this peg shelf, since I have really been in dire need of some organizational help! We received the 4 Peg Shelf in Black, and it looked great in the boy's room! Our original plan was to hang it down low enough to where the boys (well Tater, Bean, is still too little) could hang up their coats, jackets and backpacks on their own. In theory, this sounds like a great idea right? Less work for mommy is always good! However, it didn't really work out that way. We had a few problems at first with the pegs falling being pulled out of the shelf by little destructive hands, even after we super-glued them in place, so we had to relocate the shelf to the living room, where it is now up high enough for only grownups to access it.The boys were very sad when I took away their weapons/coat pegs LOL! However, the shelf looks great in the living room, and now it can hold the whole family's coats and bags. It is a pretty sturdy little shelf, although I wouldn't like hang bricks from it or anything. It looks great and it serves it's purpose very well! If you are looking for a great accent shelf for your home, I would definitely recommend one of these. However, if you have a bigger family than we do, you might want to opt for the 6-peg shelf, since our stuff gets crowded up on the 4 peg shelf as it is. These shelves come in several different colors, and I would really like to put another one in my kitchen and maybe one in my bathroom as well. 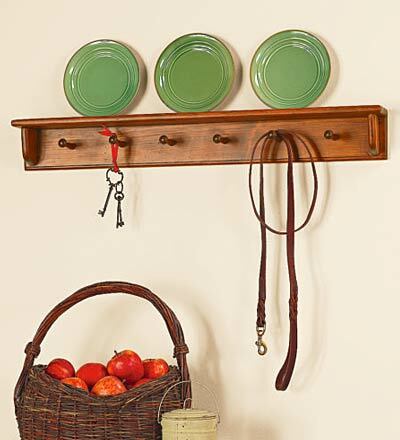 If you are looking for adorable, functional and affordable items for your home, check out Plow & Hearth today! I received a product from the company for the purpose of this review. Although a review product was received all opinions and thoughts are 100% my own.